It's a worm but it's a lizard but it's a worm! Yet the entire population lives in just a patch of one peninsular. 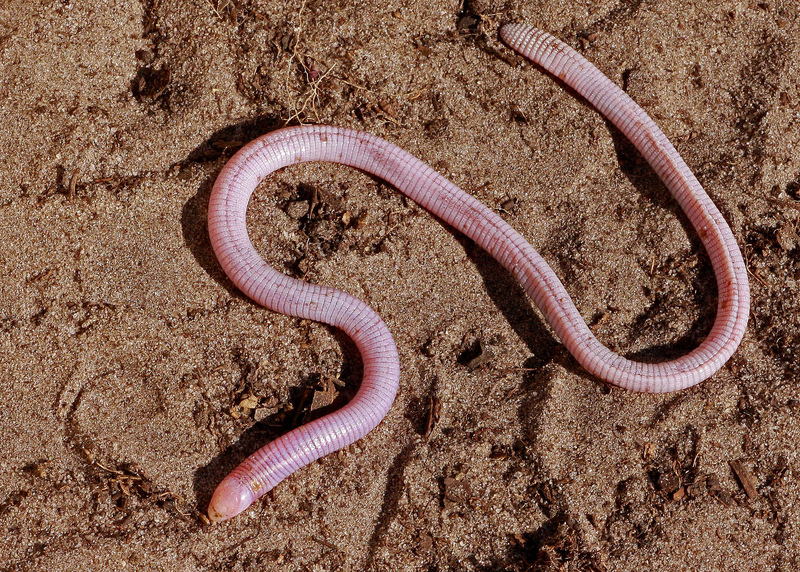 The Florida Worm Lizard is certainly not a worm, though you could easily be fooled. 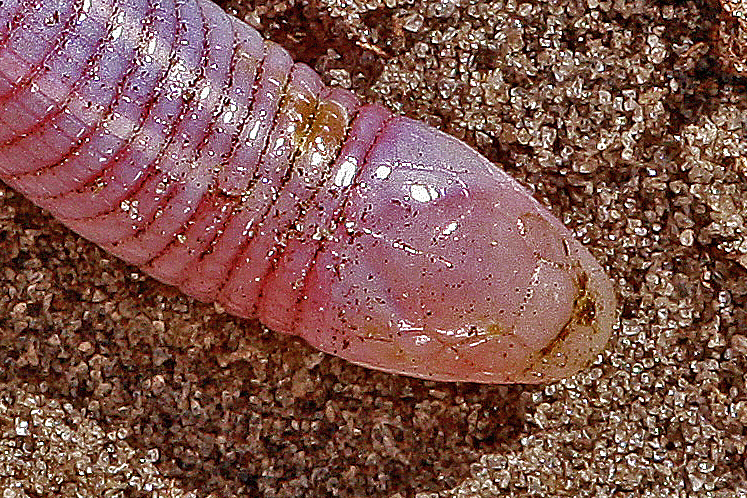 With their underground, burrowing lifestyle and a pink body that appears to be segmented, they look and live a lot like a friendly earthworm. And at some 30 cm (1 foot) long, quite a large one at that. They even climb up to the surface when it rains too hard! However, Worm Lizards are actually the reptiles who belong to a group known as Amphisbaenia. This in turn is within the order Squamata, which also contains all the snakes and lizards. The exact details of the relationship between snakes, Amphisbaenians and all those four-legged reptiles we call lizards is far from clear, but I doubt our Florida Worm Lizard worries his pretty, little head about that. The word Amphisbaenia means "to go both ways". It's a name they share with a mythical beast who was a serpent with a head on both ends, so it could move both forward and back. That wouldn't be so bad except they also had a venomous bite on both ends. Such is the way of mythical beasts. Real Amphisbaenians are similar, except they don't have even one venomous bite let alone two, and their tail isn't actually another head. It just looks like it because their tail end stops abruptly instead of tapering away and their head looks so featureless. They can still move forward and backward through their burrow even without an extra head, which may be even more impressive than the mythical beast. 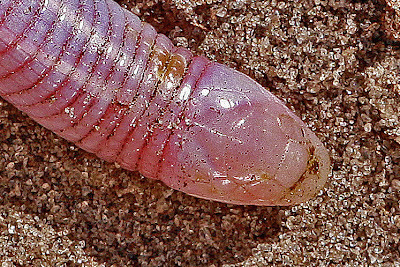 Burrowing through darkness, Worm Lizards scarcely have a need for eyesight. Their eyes are tiny and covered in scales so they're protected from the soil, but they can still tell light from dark. Their nostrils also point backwards so they don't get filled with mud all the time. It would be very difficult for the limbless Florida Worm Lizard to carry a handkerchief to sneeze into. 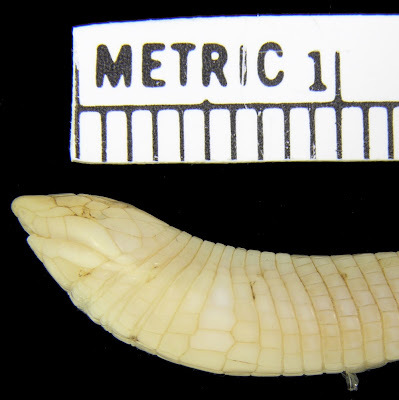 In fact, the famous Mexican Mole Lizards, or Ajolotes, are the only Worm Lizards with any limbs whatsoever and they don't seem to carry tissues, either. Amphisbaenians have a bony, little skull for pushing earth out of the way, while their lower jaw slots neatly into an overbite that ensures they don't get a mouthful of soil as they seek out real earthworms and other subterranean creatures to plunge their surprisingly powerful jaws into. Their skin meanwhile is rather loosely attached to the body and its segmentation means that it can concertina. Worm Lizards can push their skin forward, press it up against the wall of their burrow and then use their muscles to pull the trunk of their actual body forward. It's quite disgusting, but life underground was never easy and no-one can see them anyway, so they can pretty much do whatever they want. With these subterranean habits it's no wonder Worm Lizards are so little known and difficult to study. 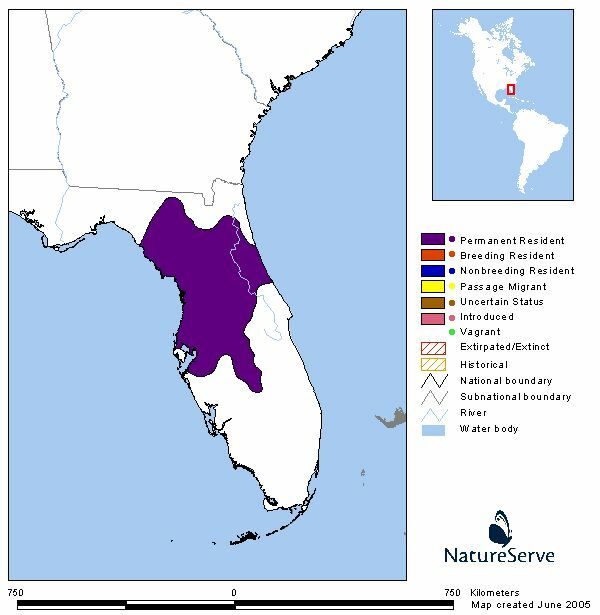 At least with the Florida Worm Lizard we know they lay a mere 1 to 3 eggs in summer, which hatch a few months later. It's interesting to note that there were once many more Worm Lizards throughout North America. Fossils have been found dating back over 60 million years, to just after the reign of the dinosaurs. It's clear that the Rhineuridae family used to be a lot bigger and more widespread than it is now. All that's left is a single species clinging on to a single state by the skin of its teeth. Thank goodness for that weird, loose, wrinkly skin! Must be rough being a worm lizard. No snake venom, no lizard legs... Really the only option you've got is to trick a bunch of earthworms into worshiping you as their worm god. @TexWisGirl: They seem to have precious little interest in moving from there, anyway! @Crunchy: As Plan B's go, become a worm god has to rate quite highly! Oh wow! That has got to be some kind of infinite! It rained so much here in Gulfport Florida That I gasped when I found a 10 inch long by 1" wide DEAD Worm lizard. which I did not know even existed. Sadly not quite loved by me, I practically vomited since I garden with no gloves all the time. But Now I feel sad, one less of this bizarre species. That's a shame. But yes, I don't think I would respond well to finding a large corpse right next to my bare hands! I was just bit by a worm that looked just like this creature. It hurt and still hurts. I live in Charlotte, NC. I hate to tell people, but this worm is in Charlotte, NC now!! Ooo! That's bad for your bite but good for them! I just had my dog bring one in the house. Freaked me out! Haha! Not the best entrance! I just found one dead in my yard. Really wierd. Yeah, I can imagine that would be quite a creepy discovery! I was walking along a sandy area one day and this huge thing came up out of the dirt in front of me so fast, looking so freaky and opening its mouth. I got so startled I jumped back, grabbed a rock and dropped it on his head, then I felt bad. I was shaking though, feeling like I had just escaped some monster. I asked people about it and they said it was an illusion from the heat. It looked like these things but pale pink, almost see through, and was quite fat. I imagine it was also long but only part of it was sticking out. The ground was rippling for a ways though so I figured to to be quite long. I remembered that scary guy today and decided to look it up. This lizard is the closest thing to what I saw, and burrows so I guess that's what I saw. Since they are rare, that explains why people didn't know what I was talking about and why some thought I was bonkers from the heat. I thought it was trying to attack me. I still felt bad for I figured it must be rare and I hoped I didn't kill it. From the way it quickly disappeared, I figure it was OK, but then I was afraid to walk there any more. That was in the summer of 1986. It's nice to see they are still around. It doesn't seem they actually pose and threat to people and now I feel even worse for having dropped a rock on him, whatever he was..
Wow, what a story! I don't blame you for being so terrified. This isn't the sort of thing you expect to see crawling out of the ground. It's a bizarre mix of snake and earthworm! You shouldn't feel too bad, though. They're definitely hard-headed, so your rock might not have done as much damage as you think! I recently found one on the sidewalk in Apopka and had no idea what it was. Google put my mind at ease that it wasn't venomous and was a really interesting find. I brought it home safe and sound to educate the kiddos and let him go. Definitely an interesting little creature up close. Almost "cute as my wife said. Awww! So kind of you to help him out! I found one on my property with an egg. I took a picture and returned it to the dirt pile. Gosh, I guess you stumbled on THEIR property! My husband and I have a mulch pile by our house. We were digging and seems that we have a nest of them. Is that normal? I just found my 2nd one! I love in Tampa Florida. Found a very long one last year, almost 2 feet! This one looked a bit over a foot long .CREEPY!! Needless to say I am done gardening for the day! I'm born and raised in Daytona Beach (circa 1960). Loved snakes, lizard & bugs my entire life, never met one until today. I'm so very upset I may have either stepped on him or the recycle bin ran him over. He's bleeding from his adorable little mouth. I am heart broken!!! Am so hoping he'll be alright!!! !